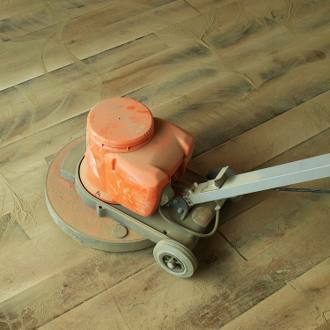 Your floor has lost its youthful shine - so it’s time for a repolish. If it is still in good condition, it may be sufficient to just buff it before re-coating with wax or lacquer. * the machine is heavy and powerful. Practise on a small hidden away area first before embarking on the whole room. * be prepared for noise – and the spread of dust. * allow plenty of time. A medium sized room can be completed in a weekend. It can be a fiddly job with some hands and knees work. * inform your neighbours – and only work during the day. 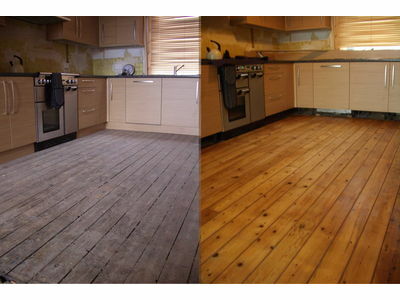 A floor that has been stained may require considerable sanding as the stain varies in its penetration of the timber. Has the floor been sanded before? Three sandings are the maximum before the boards become too thin..
One: Clear the room of as much furniture as you can. Remove any carpet and underlay, with all tacks and staples. Use a nail punch to hammer back any producing nails a good 3mm below the floorboard surface. Two: If the floor has been sanded before, it probably doesn’t need levelling. Fill the nail holes with a matching timber filler. Floors having their first sanding should have their nail holes filled after an initial coarse sanding. Three: Seal int ernal doors and windows with wide masking tape to protect against dust. Four: Start with a medium grade paper in the large sander. Align the machine diagonally across the floor and start it with the drum raised. When it reaches full speed, start moving, then lower the drum to begin sanding. Keep moving, and when you reach a wall, lift the drum before stopping. On the return, overlap slightly on the sanded strip. Watch that drum! Never let it rest on the floor while the machine is on, unless you want a depression in the boards. Five: With the diagonal sanding done, vacuum – and sand again along the floorboards in the direction of the grain. Sand just sufficient to remove the old layers of sealant. Six: Use the smaller edging sander to work up against the skirting. Sand down to the same level as the large machine, and keep the machine moving. This will still not get into corners, so use a scraper along the grain to remove the dirt and sealant until the timber is at the level of the rest of floor. You may also need to perform sanding by hand in awkward areas. Seven: Give the floor, including edges, a final sand with a fine paper, then sweep up the dust and discard. Allow any dust in the air to settle, then vacuum the floor thoroughly. Eight: Apply stain if you wish to change the colour of the floor. Nine: Apply the first coat of the sealant, according to the manufacturer’s instructions. Start by brushing around the edges. And then use a roller with an extension handle fitted to the frame. 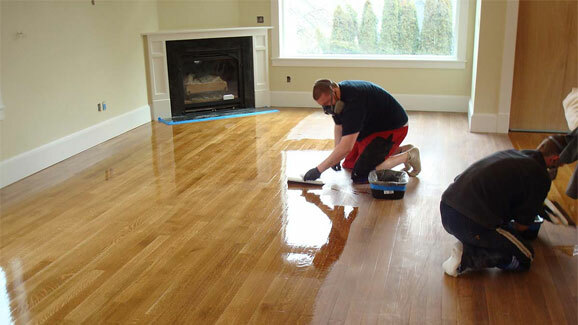 Ten: Once the first coat is dry, apply as many coats as recommended, making sure each one has dried. The floor will be suitable for light traffic the next day, and normal traffic after about a week. Move the furniture back when the surface is fully dry in two to three days.